Shopping for a timeless bible gift or traditional spiritual keepsake to celebrate any special religious milestone to be cherished forever? 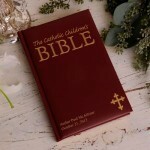 Help the Catholic child learn more about his/her faith with this excellent introduction to God’s word, our Personalized Catholic Children’s Bible. With easy-to-read text and vibrant illustrations, this Bible boasts a soft white or maroon vinyl cover, gold stamping, edging and ribbon and is perfect for daily reading or reading together. 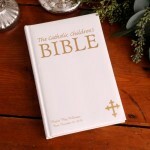 A great gift for any religious occasion! 320 gilded pages. Measures 6” x 9” and includes gift box. Personalize with two lines of up to 30 characters per line. 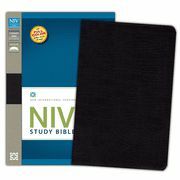 The NIV Study Bible is the #1 bestselling study Bible in the world’s most popular modern English Bible translation the New International Version. Since its first release in 1985, the Gold Medallion Award-winning NIV Study Bible has become the treasured and trusted companion of over nine million Bible readers. The in-depth notes are coded to highlight notes of special interest in the areas of character study, archaeology, and personal application. Visually arresting section breaks help you find your bearing in the Bible. Full-color photos, maps, and illustrations make this study Bible accessible and friendly. Referred to daily by millions of pastors, students, church leaders, and other Bible readers around the world, the over-20,000 NIV Study Bible notes are the handiwork of the same translation team that produced this Bible’s text. The very best evangelical scholarship that brought you today’s most popular modern English Bible also contributed to the most celebrated and widely used study notes in existence. All of these features, and more, also make it perfect for homeschool use. Like no other Bible, the NIV Study Bible places an entire resource library for Bible study in your hands.